Sen. Camera Bartolotta (R-Washington), sponsor of legislation heading for enactment, Senate Bill 449 (Tierne’s Law), allowing Magisterial District Judges to use a risk assessment tool when determining bail in domestic violence cases. House Bill 1952 addresses recent judicial decisions regarding registration of sexual offenders in the Commonwealth. Senate Bill 761, sponsored by Sen. David Argall (R-Schuylkill), would amend the state Constitution to allow gubernatorial candidates to select their running mate subsequent to the primary election, which is a process similar to how presidential candidates currently select their vice presidential running mates. Senate Bill 135 permits the use of a leashed tracking dog to track white-tailed deer to recover an animal which has been legally harvested or wounded. Senate Majority Leader Jake Corman (R-Centre) and the family of Tim Piazza on Friday announced a comprehensive rewrite of the state’s hazing laws to prevent future hazing-related tragedies by addressing prevention, enforcement and transparency. At a joint hearing Tuesday on pipeline safety in Pennsylvania by the Senate Consumer Protection and Professional Licensure Committee and the Senate Environmental Resources and Energy Committee, Sen. John Rafferty (R-Montgomery) raised major concerns regarding the mismanagement and misconduct by Sunoco Pipeline’s executives, stressing that stronger laws and more state oversight are needed for the safety and well-being of people and their private property. Patients who require opioid prescriptions would have less risk of addiction under legislation announced by Sen. Ryan Aument (R-Lancaster). Senator Aument’s bill would require patients to enter into treatment agreements with prescribers to ensure patients understand the risks of addiction and the importance of adhering to safe, responsible guidelines for opioid use. The treatment agreements would require new patients to undergo baseline and periodic drug testing to monitor adherence to the prescribed treatment plans. The Senate Appropriations Committee, chaired by Sen. Pat Browne (R-Lehigh), approved five bills on Monday. 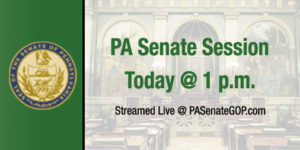 The Senate Consumer Protection and Professional Licensure Committee, chaired by Sen. Tommy Tomlinson (R-Bucks), and the Senate Environmental Resources and Energy Committee, chaired by Sen. Gene Yaw (R-Lycoming), held a joint public hearing Tuesday to address safety and management issues of pipeline operations in Pennsylvania. The Senate Finance Committee, chaired by Sen. Scott Hutchinson (R-Venango), approved three bills on Wednesday. The Senate Game and Fisheries Committee, chaired by Sen. Pat Stefano (R-Fayette), held a public hearing Wednesday on the annual reports from the Pennsylvania Game Commission and the Pennsylvania Fish and Boat Commission. The Senate Health and Human Services Committee, chaired by Sen. Lisa Baker (R-Luzerne), approved four bills on Tuesday. The Senate Judiciary Committee, chaired by Sen. Stewart Greenleaf (R-Montgomery), approved 12 bills on Monday. The Senate Local Government Committee, chaired by Sen. Scott Wagner (R-York), approved Senate Bill 1005 on Tuesday. The bill makes numerous changes to the County Code. The Senate Veterans Affairs and Emergency Preparedness Committee, chaired by Sen. Randy Vulakovich (R-Allegheny), approved four measures on Tuesday.